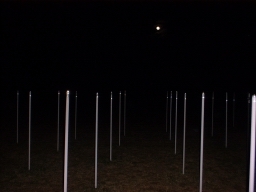 Field is the name of an installation by the artist Richard Box. 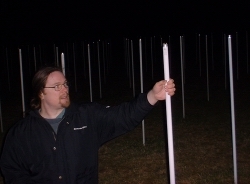 It takes advantage of the principle that a fluorescent tube will glow in the electric field generated by high voltage power lines, as I demonstrated in experiments with pylons. 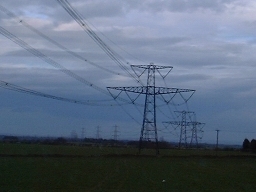 As a pylon enthusiast, it was worth the trek to Bristol to see Field! The atmosphere was informal and friendly. There was a caravan which I think was selling drinks, and Richard was very helpful in directing me to a parking place only a short walk away, and welcoming when we arrived. Mike commented that it was "cool", and it was indeed more spectacular than I expected, and quite fun to move around and see the lights change. Yes, it was a bit geeky, but I'm very glad I made the trip! 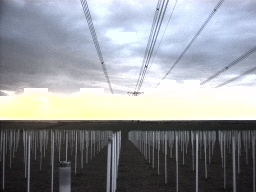 In October 2004 Richard Box won a £20000 prize for this installation; detailed here on BBC News Online. 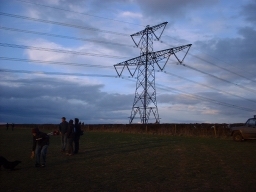 Approaching the site, and the range of low-profile pylons. 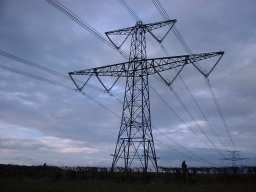 The nearest pylon to the site, in all its glory! We arrived at sunset. 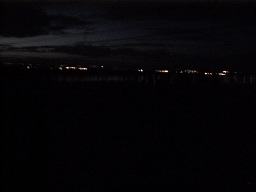 Looking down towards the lights of Bristol. 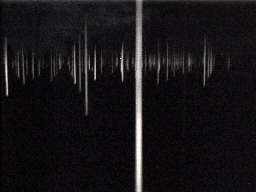 Glowing tubes are visible in the full-size image. 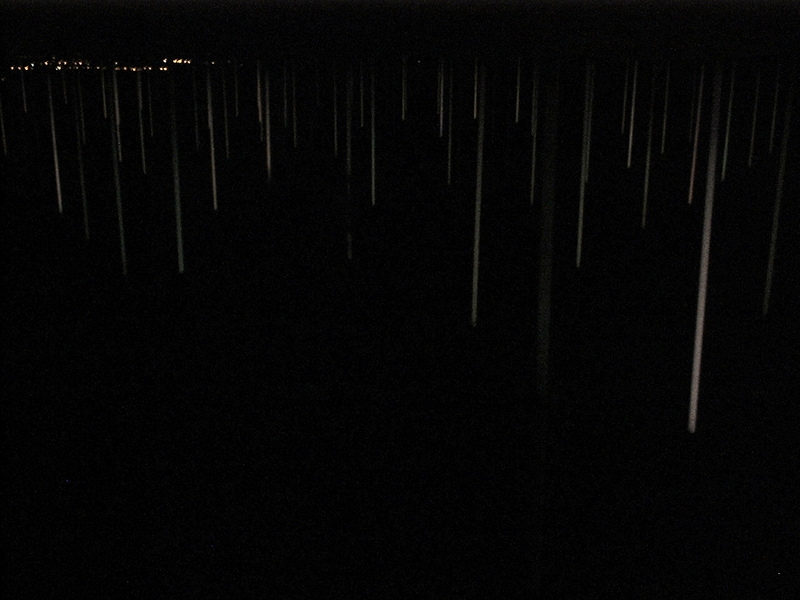 The same photo, processed to show the tubes, lightly glowing. 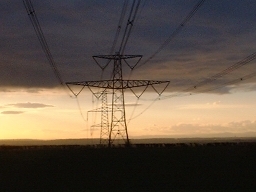 A closer look at the sunset, and the row of pylons. Looking up the hill away from the sunset. 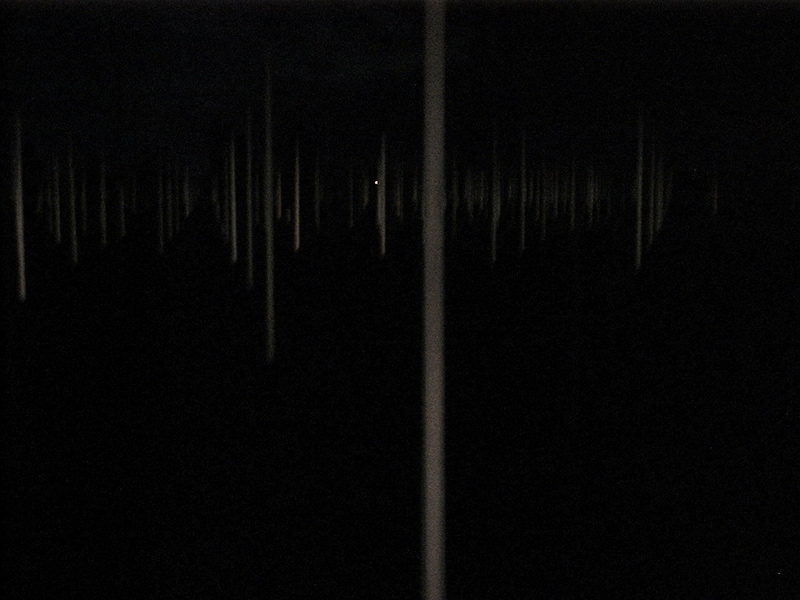 This photo is unprocessed and you can see the tubes start to take on an eerie glow. This is the best photo to see fullsize. 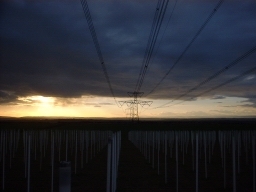 Last view of the pylon as we left, to return by night. Richard Box, the artist, is in the group in the foreground. Returning an hour later, looking down towards Bristol (the same direction as the sunset previously). The glowing tubes. 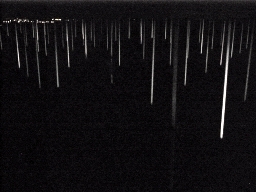 My camera is useless in the dark without flash, so I processed this photo to show the tubes more clearly. Mike plays with a tube. They changed how they glowed as you drew nearer and as you touched them they would light above your hand. With a stroke towards the bottom you could set the tube glowing when it had stopped. Overview of the site (again processed). 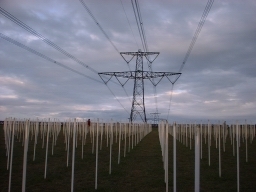 The poles were about 5 feets apart, 22 rows by 22 columns. While we were there, unrestrained children broke four of them. A view using the flash this time. The full moon was brilliant, meaning we didn't need a torch to walk back to the car.